Stage Production "All Shook Up"
Recently I had a chance to see the musical All Shook Up and I jumped at it. Most Elvis fans have heard of this Broadway production based on Elvis’s music, but relatively few of us have actually had the opportunity to see it. The musical first opened in Chicago for a two-month tryout period beginning in December 2004. It then opened on Broadway at the Palace Theatre on March 24, 2005. It closed six months later on September 25 after 213 performances. 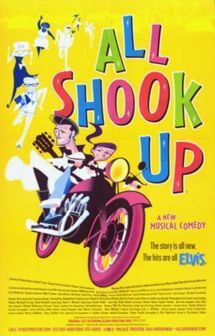 I believe the Broadway cast took the show on tour sometime later, but if you weren’t in Chicago or New York for All Shook Up’s original splash, or if the traveling show didn’t come to your town, odds are you’ll never get an opportunity to see this Presley-based musical. About the only chance you’ll have is if some local theatre group in your area decides to produce All Shook Up. That’s exactly how I got to see the show. Coeur d’Alene, a resort community in the Idaho panhandle, is only about 30 miles east of Spokane, where I live. The Coeur d’Alene Summer Theatre is a classy outfit that draws talented actors from around the country to perform in its series of summer stock productions. The theatre’s first offering of summer 2008 was All Shook Up. All Shook Up is what’s called a “jukebox musical,” since it utilizes a recording artist’s past popular music rather than original tunes. There have been several other attempts to make a musical out an artist’s music. Some have been very successful, most notably Mamma Mia (ABBA) and Jersey Boys (The Four Seasons). Moving Out (Billy Joel) has had some moderate success, as well, while Good Vibrations (The Beach Boys) lasted only seven weeks on Broadway. Of course, as an Elvis fan, I absolutely loved All Shook Up when I saw it in Coeur d’Alene. It’s crammed with Presley music—a whopping 24 musical numbers! One thing to understand from the start is that this show is not a showcase for an Elvis impersonator (or “Elvis Tribute Artist” for those who prefer the politically correct term). Chad, the lead character, is a sexually-charged, leather-jacketed motorcyclist, sort of a cross between Elvis and Marlon Brando. And while Chad does perform several Elvis rock ’n’ roll numbers, complete with guitar and pelvic movements, most of the Presley songs in the show are actually performed by 10 other cast members, half of them female. As the show moved along, it became clear why this unusual collection of Elvis songs had been chosen. The lyrics of each fit the dialogue required at certain points in the background story. As the reviewer above noted, watching All Shook Up really is like watching an Elvis movie in the sixties. The characters burst into song, sometimes for no apparent reason, but usually to express amorous feelings in lyrics rather than dialogue. The background story is said to be based on Shakespeare’s “Twelfth Night.” Chad blows into a small town to get his bike repaired. While there he shakes up the dreary lives of the town’s citizens, and soon most everybody is falling in love with someone who loves somebody else. Of course, all the couples get sorted out in time for the finale. So, why didn’t All Shook Up make it on Broadway? The reason is the same one that derailed Elvis Presley’s once promising acting career—too much music. When Elvis’s movie-going fans demanded that he sing often on the big screen, that was the end of his dream of becoming a dramatic actor. When the producers of All Shook Up overloaded it with 24 musical numbers, that left little time between songs to develop the storyline. In fact, most of the dialogue in All Shook Up seemingly serves only to set up the next musical sequence. All the music in the production is great for Elvis fans, but it’s too much for the general theatre audience. It's pretty impressive that an entire Broadway production could be based on Elvis' music, and named for a song that was titled by the shaking of a Pepsi bottle! 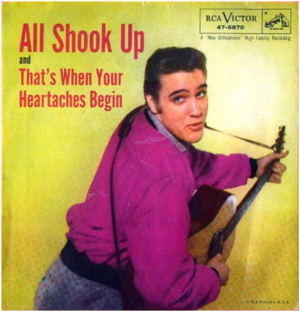 "All Shook Up" was Elvis' biggest chart record ever so the show was named appropriately. Even though glass bottles of Pepsi may be a thing of the past, Elvis' music continues to live on. "So, why didn’t All Shook Up make it on Broadway? The reason is the same one that derailed Elvis Presley’s once promising acting career—too much music."